People expect the Stirling Smith to have portraits of past Provosts of Stirling. This is not the case, for unlike the other major Scottish cities, Stirling has never commissioned or curated civic portraits. There are few Stirling Provosts represented in the Smith’s collections and most, like this one, were painted as private individuals. George Christie was a businessman of substance, engaged in his father’s brick and tile manufactory at Forthbank. It was shown as a large enterprise on Wood’s map of 1820 and by the time George inherited it, there were other operations in Perth, Aberuthven and Blackgrange. 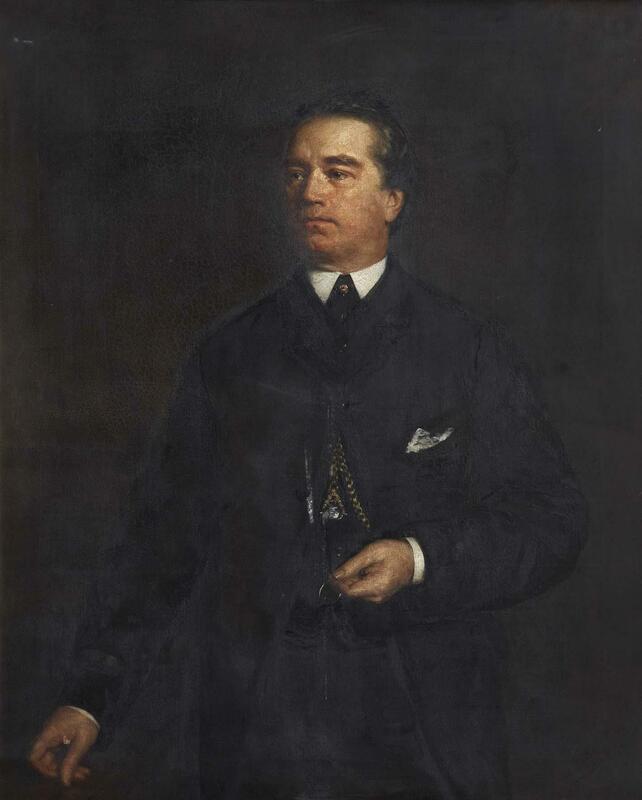 Christie was first elected in 1867. In his time in office, Stirling went through radical changes, with the first division of the burgh into wards, and the introduction of the School Boards from 1872. The Stirling Smith was built in his time as Provost, so his name is affixed to the building. The Christie Clock Tower was built in Allan Park in his memory. In retirement, Christie became very active in freemasonry. He was a member of Lodge Stirling Ancient no. 30 and took 32 degrees in masonry. In 2006, the late Thomas McDonald of Lodge Abercromby project-managed the complete restoration of the Christie clock.